Jeep perfect pockets back pack diaper bag combines ultimate organization with clean, handsome styling. 12 pockets make for storage heaven when on the go with baby. 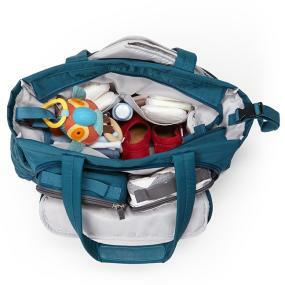 Stash pacifiers, creams, keys, and diapers in the small zippered pockets throughout the bag, and larger items like toys, and clothes in the spacious main compartment. Bottles stay fresh in the insulated side pocket. 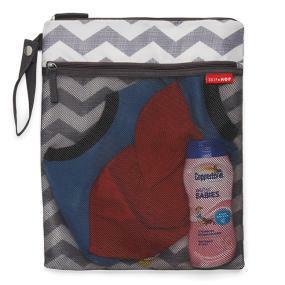 This jeep diaper bag features a hard wipes case with easy pop open feature for quick access to baby wipes. 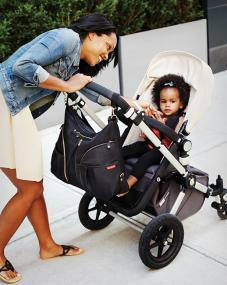 Choose between 2 hands free carrying options, padded shoulder straps or stroller loops. Padded back panel for added comfort. 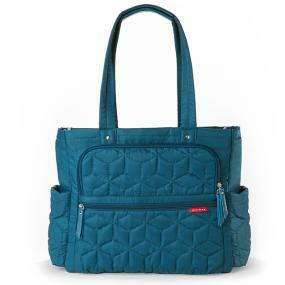 The Skip Hop Duo Double Deluxe Diaper Bag has all the great features and style of the DUO. 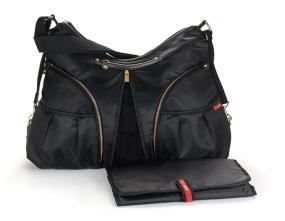 It has sixteen pockets, which can be carried by the tote straps or messenger strap. This features new shuttle clips; a unique strap and fastening system that allows the DASH to attach neatly and conveniently to the handlebars of double stroller. 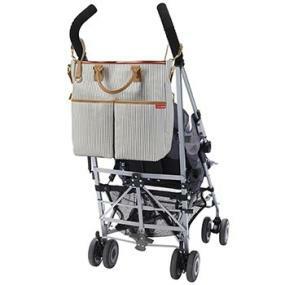 The diaper bag is attached to the stroller from which the shoulder strap can be attached or removed for a cleaner look. 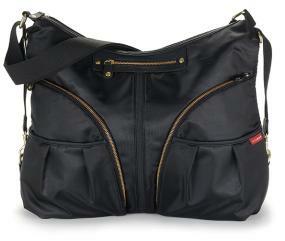 Click in the shoulder strap the DUO double converts into a cool, hip tote or a messenger style diaper bag. It includes a new magnetic closure throughout. These machine washable, waterproof bags are perfect for carrying your wet and dirty items. Planet Wise wet bags are innovatively sewn with hidden, sealed seams for no leaking. Planet Wise wet bags also resist most odors and stains, keeping smells in. Available in three sizes: small-7.5″x 10″, medium-12.5″x 16″ and large-17″ x 21″. Large size comes with snap handle. Where form meets function. Dash sports a hip, city style and great functionality. With 11 roomy pockets, there is space for everything baby needs, and a zippered compartment for mom and dad’s personal items. The bag includes our patented shuttle clips, allowing it to quickly and easily convert from a shoulder bag to a stroller bag. When attached to the stroller, you can leave the shoulder strap attached or remove it for a cleaner look. The dash includes magnetic closures throughout and a comfy shoulder pad. 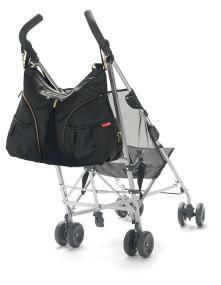 Features: hangs neatly on a stroller and can be worn over the shoulder, includes patented shuttle clips-leave the shoulder strap attached or remove it for a cleaner look, slip-resistant stroller straps, hidden magnets allow the flap to close in different ways, adjustable shoulder strap includes soft, removable shoulder pad, eleven pockets include a zippered personal pocket, two side pockets for bottles or sippy cups, key fob and easy-access pen holders, contrasting lining makes it easy to find everything inside, cushioned changing pad, BPA-free, phthalate-free. Each SaraBear Diaper Caddy by Munchkin starts with a custom shaker style basket in a tight weave of real wood. A handle is attached on either end of the basket and can be collapsed to lie along the side of the basket. Each liner is made from a heavy weight, 100% cotton fabric. The basket will firmly hold a baby wipes container, and has pockets for diapers, ointments, burp cloths and swabs. The caddies are PVC free and the dyes used in the textiles are entirely formaldehyde free. Any wood stain that is used on a SaraBear basket is water based and lead free. The packaging was deliberately designed without the use of plastics. At a moment’s notice or a baby’s cry, take everything you need to care for baby from one room to the next. STUDIO diaper tote is stylish enough to pair with a little black dress, but practical enough to keep you and baby stocked for a long day at the playground. Two insulated side pockets hold baby’s bottles, food and sippy cups, while 12 more pockets keep your phone, wallet, keys and other personal items dry, secure and within quick reach.STUDIO’s adjustable stroller straps attach neatly and conveniently to the handlebars of any stroller. Unclip, and STUDIO converts back into a tote that will look chic well past babyhood. 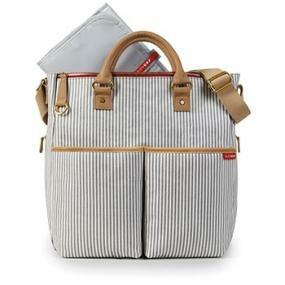 Keep track of baby’s necessities in style with the JJ Cole Collections Satchel bag. The spacious interior includes multiple organizational compartments while the exterior offers easily-accessible open and zippered pockets. The Satchel includes 7 exterior pockets and 4 interior pockets and a convenient bottle pocket, providing plenty of space for everything you need along the way. The padded shoulder strap is removable to fit your own unique style and needs. 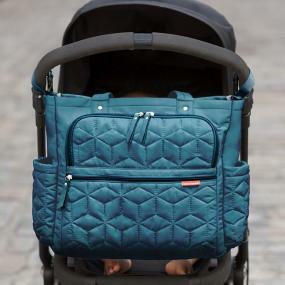 The Satchel includes grips stroller attachments and a coordinating changing pad. Dimensions: 18″h x 12″w x 7″d. Weight: 1.6 lbs. 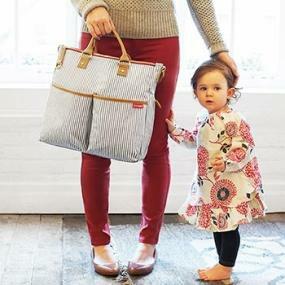 We listened to parents to create the most functional and fashionable baby bag yet! The highly designed bag comes loaded with two packing cubes and 11 pockets to keep everything in its place, along with a cushioned changing pad. Featuring lightweight fabric and quilted details, the water resistant bag is perfect for anywhere the day might take you. 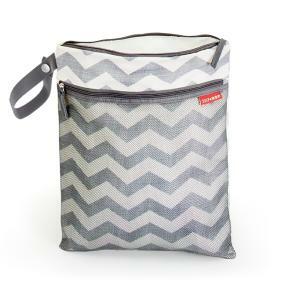 A convenient front zip pocket holds one matching mesh packing cube and one trendy patterned insulated cube, which is perfect for bottles, sippy cups, or snacks. The Forma is the ultimate in pack and go organization from infancy to toddlerhood and beyond. 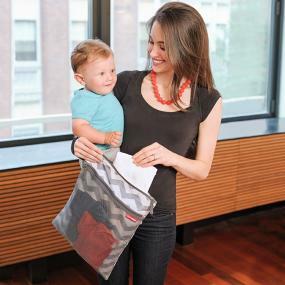 This sleek clutch unfolds to a padded wipeable changing area. Unfolds to a large, 19″ x 28″ pad. Attach-anywhere handle. Pocket holds wipes case and multiple diapers. 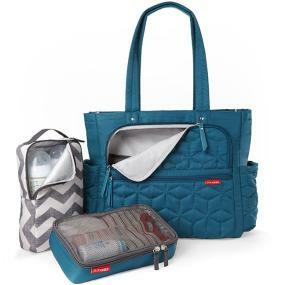 Slim design fits in diaper bags. Stylish and lightweight, Versa expands to fit your life. 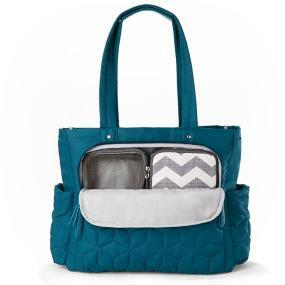 Versa is the high-style diaper bag keeps up with you and baby through errands, playdates, work and even the gym! Two insulated front pockets are roomy enough to store baby’s bottles, sippy cups and food. Nine more pockets easily organize diapers, toys, clothes and all of your personal items. A quick zip down the center provides over 20% more storage capacity. Expandable center makes bag 20% larger! The Chelsea Diaper Satchel is a runway-inspired style with the functionality you need from day to night. With its chic exterior and twelve spacious pockets, you’ll be able to fit your most-needed items and look stylish doing it. 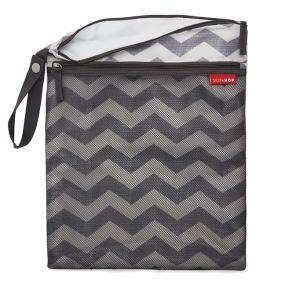 Insulated side pockets perfectly fit bottles, sippy cups and snacks too. This day-to-dinner design also features a front compartment that flips down for a second look. Modern moms flock to the Fisher-Price name. They know it stands for style, dependability and innovation, and the inspired design of this Deluxe Messenger Diaper Bag confirms all that and more. Served up in a trend-on shade of gray with leaf green accents, it is perfectly put together with your busy lifestyle in mind. You’ll love the four outside pockets that make up the featured FastFinderTM Pocket System—it helps you find what you need when baby needs it. They include a thermal insulated bottle pocket, an exterior wipes pocket, easy-wipe pacifier pocket and a large diaper pocket. There is a large, Velcro-close pocket in the back on the bag to stash your tablet, phone, keys and other necessities, and the double top strap is adjustable and padded, so it is always comfortable and a perfect fit. Because cleanliness is a must for all baby’s things, the bottom of the bag is reinforced and footed, keeping your bag safely off the floor. The top flap, pockets and inside surface are fully lined in an attractive leaf green linear print, and there is even more storage space on the generously proportioned interior. 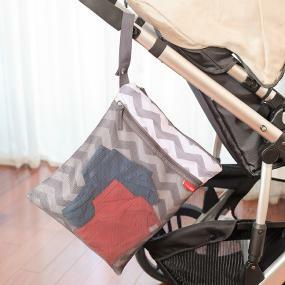 Here you’ll find two mesh pockets, a large pouch pocket, a bag divider and an ever-so-handy changing pad. You’ll be so glad you chose this diaper bag. With all the wonderful features and so much available storage space, it makes traveling with baby a breeze. The Skip Hop Duo’s multitude of pockets and compartments easily organize diapers, bottles, sippy cups, food and toys, while keeping your phone, camera, wallet, keys and other personal items safe and dry. The Duo features our patented shuttle clips, allowing it to quickly and easily convert from a shoulder to a stroller bag. When attached to the stroller, you can leave the shoulder strap attached or remove it for a cleaner look. The Duo has eleven pockets in total, magnetic closures throughout and a comfy shoulder pad. A long time favorite of new moms and dads the Duo is a must have classic. Keeps leaks and odors contained. Two handy sections keep wet and dry clothes separated; or use one pocket to keep dirty diapers at bay. A handy strap makes it easy to attach to a stroller.